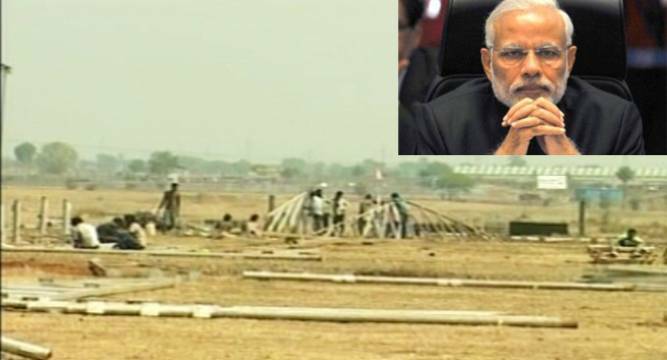 During the ‘Kisan Kalyan Mela’ at Sehore, he will release the guidelines for operationalisation of the Pradhan Mantri Fasal Bima Yojana which was approved by the Union Cabinet last month, a PMO statement said. Prime Minister Narendra Modi's Sehore rally in Madhya Pradesh is set to face protests from 'irked' farmers who were forced to cut their unripe crops to make way for a parking lot and stage. He will also highlight the government’s initiatives for the development of the agriculture sector and welfare of the agriculturists. PM Modi is also expected to release the guidelines for operationalisation of the Pradhan Mantri Fasal Bima Yojana which was approved by the Union Cabinet last month at the ‘Kisan Kalyan Mela’ in Sehore. Modi will also distribute soil health cards, and crop insurance settlement claims to select beneficiaries, the statement said.